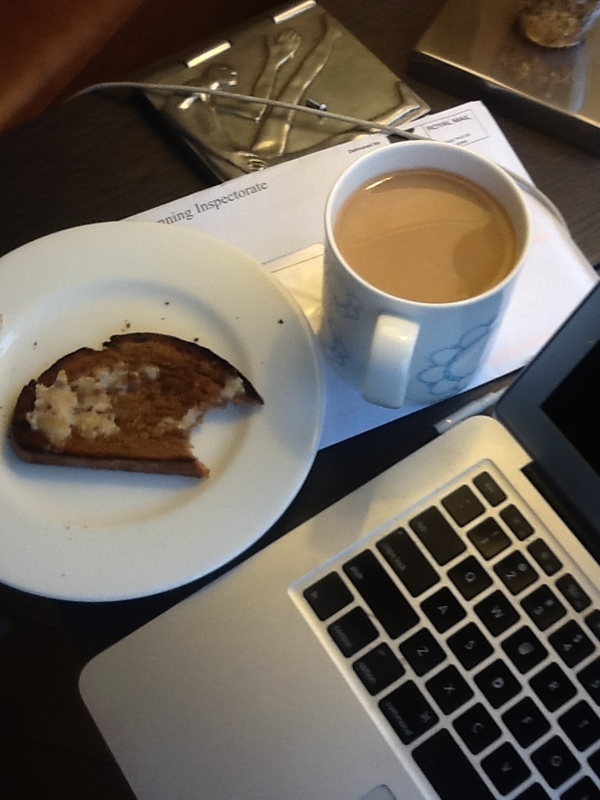 It's national toast day and here at the global headquarters of Virtuous Bread we make it national REAL TOAST day! We are celebrating by having toasted rye and whole wheat sourdough toast with schmaltz on it. Huzzah! Note the crispy edges in the photo? Real toast does not have any sugar in it so it does not go a uniform golden colour when it's toasted. Just kind of toasty and dry with definitive crispy edges. Real toast made from real bread for real people! Rye and Wheat Sourdough Bread to make Real Toast - otherwise known as Virtuous Bread (arf arf). This is 100 grams. It will be a thick paste - you have to work it with your hands to get it to come together, but there is no requirement to knead. Cover it with cling film and leave it on the counter. Knead for 10 minutes. Go for sticky, not dry in texture, adding water by hand if necessary. Pop it back in the bowl and let it rest 2-4 hours until it has clearly doubled in size. If you can remember/be bothered, “stretch and fold” the dough every hour or so during that time by doing the following: Pinch the edge of the dough in the bowl, gently grabbing about 2 cm of it. Stretch this up toward you as much as you can, stopping before it tears. Fold it over the remaining dough in the bowl, don’t push down, just lay it on top. Work your way around the dough ball, pinching, stretching and folding as often as it takes to get around to the original fold. This may take you 6-8 pinches. When you are done, cover it and let it rest. The longer you let it rise at this stage and the more you stretch and fold it the more bubbles you will get in your bread. Patience and time are the key to bubbles. After letting it do its first rise, gently pull the dough out on to a lightly floured surface. You need to shape your dough into its final shape for its final rising. Shaping gives the dough the structure it needs to rise and bake in a regular shape without unsightly bulges and collapsing insides! There are countless ways to shape and countless shapes. We will do just one. Once shaped and popped in the tin or basket, let the dough rise again until it has grown in size by 50% and passed the probe test. The probe test is simple: poke it with your finger. If the indentation comes out completely in a minute, it is ready for the oven. The second proof will take around 2-3 hours depending on the heat of the kitchen. Remember: longer is better. The longer you have let it rise before shaping it, the wetter the dough, the more you have aerated it by stretching and folding it, and the more skillfully you have shaped it, the faster it will rise. You see there are lots of variables so just keep at it and you will find the perfect dough for you in time. Preheat the oven to 230 degrees. If you have let the dough rise in a basket or a bowl, turn it out onto a baking tray that you have lined with non stick parchment or liberally covered with polenta/semolina. Pop the tray (or the tin) in the preheated oven and bake at 230 for 10 minutes and at 200 for a further 30. Or at 230 for 20-25 minutes. It will sound hollow when done. Let it cool completely before eating. Click here to learn more about sourdough and click here to take our full day sourdough course. Demystify it and bake it forever!